The database consists of linked records on over two hundred texts, more than thousand manuscripts and two hundred persons. Texts which belong to the pseudo-historical tradition of Geoffrey of Monmouth and printed books are not included. The database is work in progress: a considerable number of records have yet to be completed, while fresh discoveries of narratives and manuscripts invite new entries. The compilers of the database hope that this tool will contribute to further research into Arthurian fiction as a pan-European phenomenon. Arthurian stories constitute one of the most influential genres of western literature, and are studied intensively. Their fictional character made them ideal vehicles for expressing the social concerns and cultural values of their audiences. The research project ‘Arthurian Fiction: A Pan-European Approach’ (2004-2008), led by Bart Besamusca, resulted in two databases, one describing Arthurian texts and one describing manuscripts written between c. 1150 and c. 1550. The first database consists of features of the ca. 250 stories (data on author, date of composition, patron, language, form and structure of the text, characters, etc). The other focusses on the medieval books in which the Arthurian narratives have survived. In this database, features of ca. 1200 manuscripts were compiled (data on the date of production of the books, language, contents, layout, script, illustrations, owners, etc.). These two File Maker Pro databases were designed to be linked, in order to enable the user to access all available information on an Arthurian manuscript via the entry in the stories database, and vice versa. In this tool both databases have been integrated into one that is available online to scholars. The new database is dynamic: authorized collaborators form all over the world will be able to correct and add records to the database. Besamusca, A.A.M. & Quinlan, J. (2012). The Fringes of Arthurian Fiction. Arthurian literature, 29, 191-241. 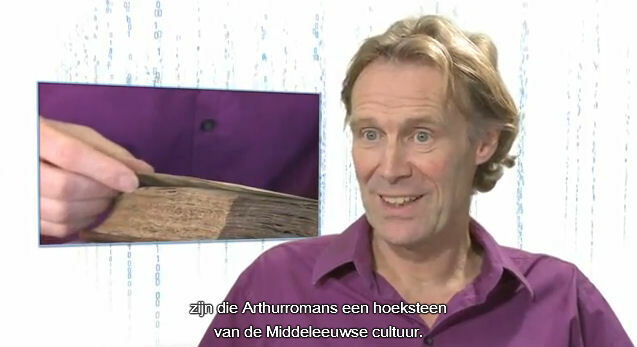 Boot, P. (2012), Manuscripten koning Arthur op tafel, E-Data & Research 7(1), 2012. Dalen-Oskam, K. van and Besamusca, B. (2011), Arthurian Fiction in Medieval Europe: Narratives and Manuscripts, presentation held at the CLARIN-NL Kick-off meeting Call 2, Utrecht, February 9, 2011. Dalen-Oskam, K. van (2011), ArthurianFiction, presentation held at the Call 3 information session, Utrecht, August 25, 2011.